Tonight I am sipping on some incredible Chai that Zandra sent to the house. It is um um good! I feel the fat pooling around my midsection already after two gulps! LOVE IT! The chai was reward if I would get in here and sit down long enough to pay my bills! I hate bill night! But the chai sweetened the event..LOL! 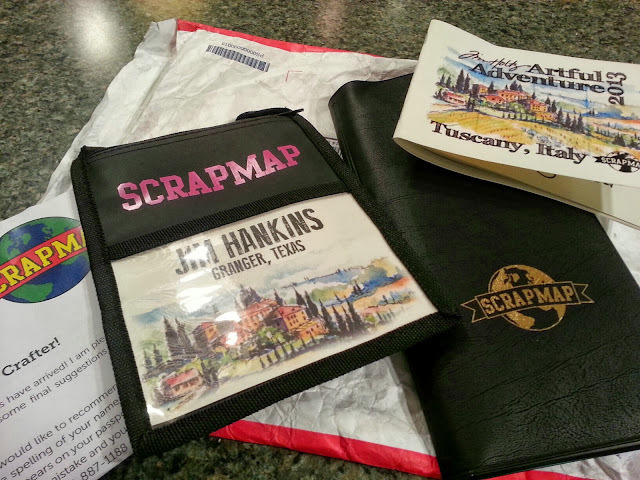 When I walked in the door, I received my tickets and info from Scrapmap for the Tim Holtz Tuscan adventure in Italy that is coming up in what...24 days-ish!!! Good Lawd! That's getting close. I think...No, I know... that I have solely been concentrating on Victory Day for the cast/boot that is to come off this week. When this magical happy day comes and reality kicks in...I will probably go into panic mode about the trip and the lists will begin to start. I'm notorious for my travel lists! Scares most people in this household when they see the amount of things that need to be done before departure...Just Sayin! But it always miraculously gets done and there is NOTHING better than scratching a line of completion through an item...Yahooo! Cool and funky! Love that you stamped and inked on text paper. See you tomorrow. Not long to go now before your cast is off and you are on your way to Italy! Your cheetah tag is very colourful! Jim, I hope your trip is the most fun thing you have EVER done. There are so many of you "neat" talented people going. Just be careful - there might be rocks on the streets or roads, so watch for them. I am just old and want my friends to take care of themselves so they can come home and show all the good times they have had. Hug Cesar for me and hug yourself too. I love you! Oh how funky is that. My grandson would love it. Hope you have a good trip and that we get to hear all about it with lots of pics! Sipping on some chai this morning...so, good! I forgot the mini marshmallows for Cesar...lol Love the background on your tag, please tell us tonight how you did it. see ya then. Such a great idea, you just continue to outdo yourself! Love this tag! As for Italy, home of my ancestors! Wish I could go. Gosh,I am so excited for you to be going to Tuscany with Tim! I tried but I wasn't fast enough on the draw! Have a glass of wine for me! Your tag is so fabulous. Love the vibrant colors and the great skull and all the details as always. Wow this is fun. I am trying to hard to get into the Halloween spirit and this looks like a ton of fun to play with! I'm A Free Man! Singing songs of happiness! It's About Time For A Post Huh?